Following on from the incredible success of the SI500, Stuart is proud to launch the SI505, microtitre plate shaking incubator. The SI505 carries many of the proven features of the SI500 but also offers ideal conditions for effective mixing of small sample volumes, such as those found in microtitre plates and micro tubes. 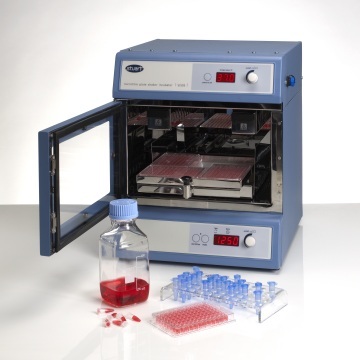 The SI505 has been designed specifically to combine a bench top laboratory incubator with the specific mixing action required for microtitre plates. Shaking is ideal for mixing microtitre plates, combining a high speed action between 250 and 1250rpm with a tight orbit of 1.5mm. This enables even the smallest of vessels to adequately mix, be it well plates or microtubes. The SI505 has independent control of speed and temperature to avoid accidental temperature adjustment. Speed is microprocessor controller and set via the digital LED control panel. The unit also incorporates a versatile timer, which can be set from 1 second to 9 days, once the timer has run down, an alarm will sound and the shaking action will cease, for safety reasons the incubator will continue to run. The temperature of the incubator can be set, via the digital LED control panel, between ambient temperature +7oC and 60oC. Careful control of the air distribution within the incubator ensures temperature uniformity throughout the sample chamber. To minimize sample evaporation the SI505 is supplied with stainless steel water trays, these are strategically placed within the unit to maintain a humidity of up to 80%, thus dramatically reducing sample evaporation over a 24 hour period. For larger views, please click on the small photos above. 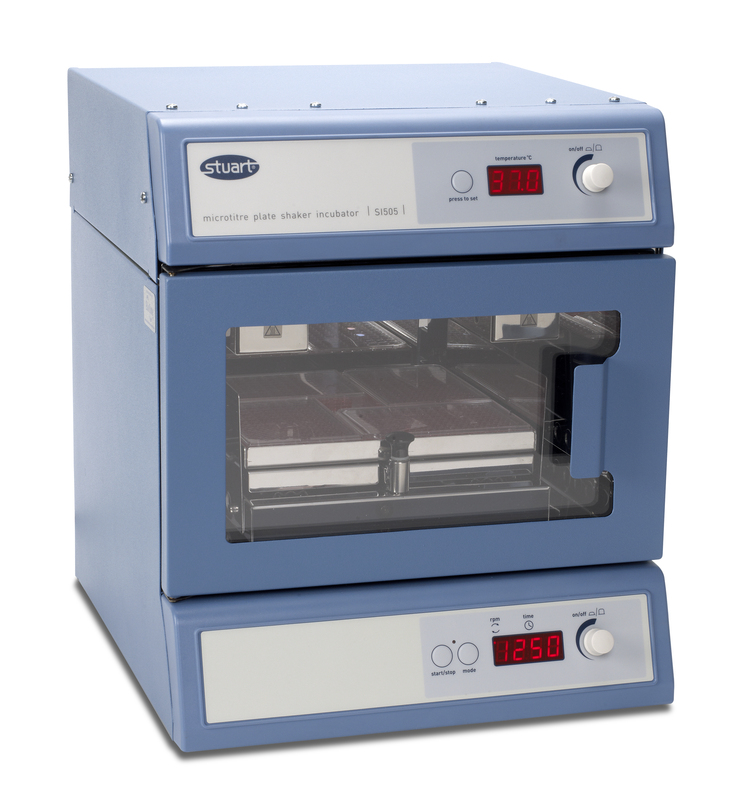 The SI505's stainless steel platform is retractable, this allows easier access to samples at the back of the incubator. During operation the platform is securely locked in place, but can be easily released when required. The platform will comfortably and securely accommodate up to four microtitre plates on the non slip mat. Or sample tube racks are available which will accommodate all common tube sizes. The SI505 also features a USB connection which allows the incubator to be connected to a PC for long term monitoring of the incubator temperature, over night of weekends for example.